Available Picture Profile setting items and options may vary depending on camera specifications. This function adjusts the color saturation. A positive value results in more vivid colors, while a negative value presents faded colors. Saturation must be adjusted in tandem with contrast. Bright and vivid settings produce video-like images, while dark and vivid settings result in film-like images. The combination of bright and light creates pastel tones, whereas dark and light settings create artistic finishes. This function adjusts the color hue. As you rotate the color wheel to the left (decreasing the set value) or to the right (increasing the set value), the colors shift along the spectrum from red to yellow, green, cyan, blue, magenta and red. Because this affects all colors, it is difficult to make specific adjustments exactly as intended. Use this function when matching coloring closely between different cameras. 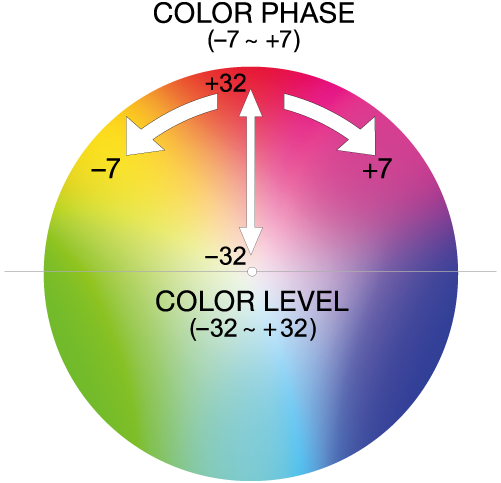 This function adjusts the luminance for each color phase. The luminance changes more drastically when the selected color is richer (higher saturation). It does not change much at all when the color is achromatic. A higher set value lowers luminance while deepening the color. A lower set value increases luminance, making the color look paler. This setting does not only enhance the apparent vividness of colors, but also can express deep, dark colors. Because each of the 6 colors — R (Red), G (Green), B (Blue), C (Cyan), M (Magenta), Y (Yellow) — can be adjusted individually, you can apply this function to just the colors you want to emphasize. Adjusts colors in your specified range. Used to alter color reproduction or create a certain effect, thorough special colors. Choose the type of color correction. Limits color display to image areas in your specified colors. All other image areas are displayed in black and white. Choose a color setting memory to apply. Only MEMORY1 settings are applied. Only MEMORY2 settings are applied. Both MEMORY1 and MEMORY2 settings are applied. Complete the color settings for MEMORY1. With [ONE PUSH SET], the [PHASE] setting is set automatically to match the part of the subject centered in the center marker. [SATURATION] is set to 0. When you complete the color settings, it's convenient to set [TYPE] to [COLOR EXTRACT] temporarily to check your specified colors, which are the only image areas displayed in color. Specify how to change the colors you set in MEMORY1, based on [PHASE] and [SATURATION]. These setting items are only applied when [TYPE] is set to [COLOR REVISION]. To set MEMORY2, follow the same steps as for MEMORY1. [COLOR CORRECTION] settings are retained even when the camera is turned off. However, each time you correct colors that vary depending on the time, place, or weather, consider adjusting the settings. Adjusting white balance or picture profile [WB SHIFT], [SATURATION], or [COLOR PHASE] settings after you set [COLOR CORRECTION] will alter colors, which may affect the subject targeted for correction. In this case, set [COLOR CORRECTION] again. For the same reason, we recommend setting a specific white balance, instead of using auto adjustment. Set up white balance shift. Specify how white balance shift is applied. Specify how to adjust the color temperature. Specify how to correct colors.